Walk + Talk Therapy is a unique form of therapy that combines physical exercise with individual psychotherapy. Physical exercise has been shown to release endorphins (feel-good hormones), which naturally trigger positive feelings helping to reduce levels of depression and anxiety, and can actually help prevent depressive symptoms. Being in nature is not only restorative but can improve your positive outlook on life and your ability to cope and recover from stress and illness. Together, walking in nature and talking with a trained counselor can help to: reduce tension and anxiety, improve mood, increase energy, cope with stress and depression, improve self-esteem and feelings of well being, and improve sleep. Walk + Talk Therapy is a great way to reduce depression, anxiety and stress while strengthening the connection between mind and body. 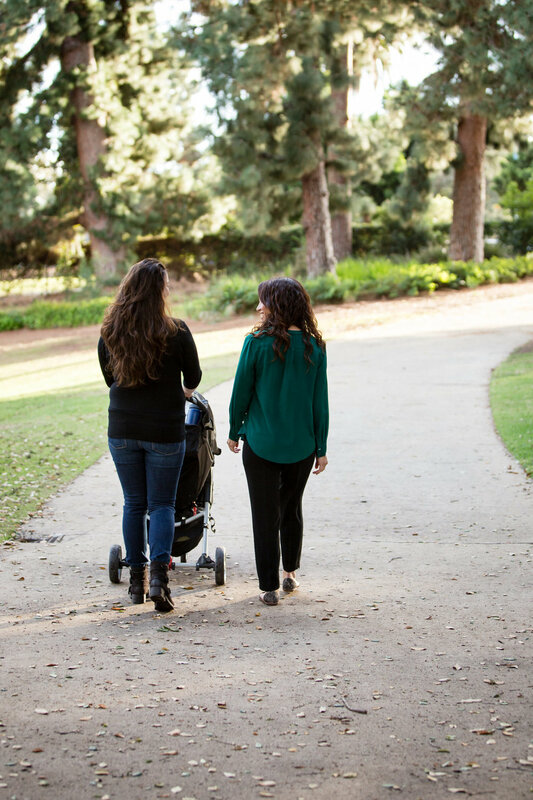 And while Walk + Talk Therapy is first and foremost therapy, many clients find walking an added bonus, helping maintain overall health during the perinatal period. Call me to discuss if Walk + Talk Therapy is right for you! I also offer counseling in my Banker's Hill office, in your home, and support groups in an effort to help you get the most out of our time together in the environment that's right for you. How does Walk + Talk Therapy work? First, we’ll meet in my office in Banker’s Hill for an initial evaluation to determine if Walk + Talk Therapy is right for you. After the initial session, following sessions are held while walking at Balboa Park, near my office. Please talk to me if you are interested in walking at a different location in the San Diego area. You should come dressed in comfortable clothing and wear shoes for walking. San Diego is fortunate to have relatively mild weather year-round. On occasion, rain or, more commonly, excessive heat may hinder Walk + Talk sessions. In these instances, we can walk outdoors anyway or meet in my office in Banker’s Hill. Can anyone participate in Walk + Talk Therapy? Most everyone can participate in Walk + Talk Therapy, as long as there are no medical reasons to prevent someone from walking. Walk + Talk is well suited for mothers with infants; you can bring your infant in a stroller or baby carrier while we walk. But, like any other form of exercise, you should consult with a physician before starting. Your choice, based upon availability. Some choose a session before or after work, while others choose a time that the baby naps, or is awake. One of my main goals is to make this as convenient as possible. Is this a cardio workout? The emphasis in Walk + Talk Therapy is on the therapy, and the walking is a secondary benefit. We walk at your pace. You should not expect an extremely strenuous workout or any sort of personal training. Confidentiality is protected as much as possible, however, I cannot guarantee that someone will not overhear or see us. If we happen to run into someone we know, we can adjust our route as necessary. It is my policy to not introduce clients and I allow my clients to make that decision for themselves and we exit the conversation quickly to protect confidentiality. Call me to discuss any questions and to determine if Walk + Talk Therapy is the right treatment for you!